Saggy neck skin, loss of jaw line definition, a double chin and jowls are reasons for people considering neck lift surgery. Some people have seen a recent side on photo of themselves and be concerned about the degree of sag beneath their chin. How is neck lift surgery done? A careful examination of the neck is essential to derive the most effective technique for each person. The facial bones may be deficient and sometimes a chin bone advancement (genioplasty) or chin implant for cases with a “weak chin” will give adequate inflation of the facial tissues and lift the neck skin. Fatty deposits under the chin can be removed with liposuction. The platysma is a flat sheet of muscle beneath the skin on the front and sides of the neck. It can separate at the front or sag from behind causing vertical bands at the band. Minor bands can have temporary improvement with Botox. However usually the muscle needs to be pulled backwards from behind or tightened at the front of the neck like a corset (corset platysmaplasty). Excess skin (which can become more obvious after platysma tightening) needs to be redraped and sometimes removed. This is usually done with an incision around the earlobe and in the groove behind the ear. In some males, a direct Z shaped incision at the front of the neck gives a very good effect. A necklift is usually also done as part of a lower facelift (and a lower facelift is often done as part of a neck lift with improvement of the jowls and marionette lines). The risks and complications of neck lift surgery and the recovery after surgery are very similar to face lift surgery. The cost of a neck lift depends on what is done at the time of surgery and the expected theatre time. A fixed cost is given after a consultation when expected time and any special consumables are determined. The quoted cost for surgery covers everything including theatre fees, consumables and all the follow up for dressings and checks in the first year after surgery. This cost includes GST. For the range of recent neck lift costs please either email us or phone us on 0800 268 526. Can I see examples of Charles Davis neck lift surgery? 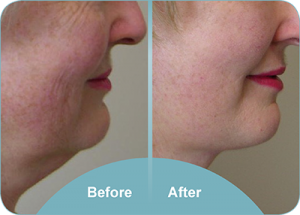 Examples of neck lifts performed by Dr Davis are shown during a consultation to illustrate the typical range of results, the limitations or surgery and the placement of the scar.